FOR IMMEDIATE RELEASE – Monday 14th January 2019 (St John’s, Antigua)… In 2018, during the Antigua and Barbuda Basketball Association (ABBA) Basketball Season, the former President, Daryll Matthew advocated for the continued technological advancement of the sport by incorporating the FIBA Live Stats as part of the Association’s Division One League. One year later, the Association, now under the directorship of newly elected President, Kebra Nanton, and Executive, sought to continue the work, by expanding the FIBA Live Stats into Divisions Two and Three, for the upcoming 2019 ABBA Season. Due to this new venture, and the Association’s vision, Antigua Computer Technology (ACT) partnered with ABBA by sponsoring two laptops to facilitate the FIBA Live Stats, to be introduced in Divisions Two and Three. 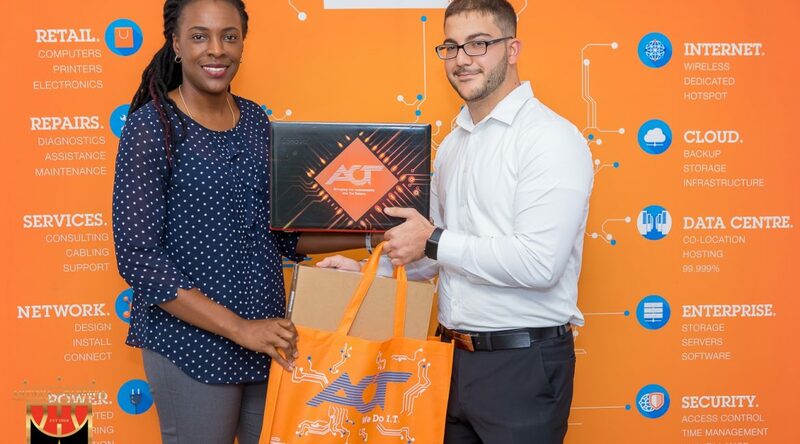 As confirmation of its commitment to the development of sports in Antigua and Barbuda, ACT’s representative, Andrew Doumith expressed his pleasure to join forces with the Association, as a corporate partner, through the donation of two new Lenovo laptops. President Nanton thanked Mr Doumith and the Management of ACT, for their timely contribution, as the Association prepares to commence the 2019 Season on Sunday 27th January.